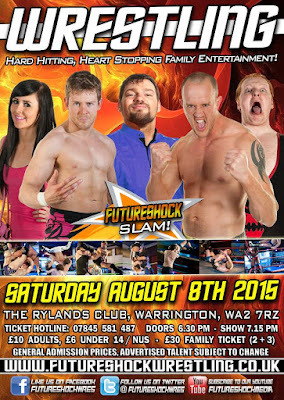 This weekend sees numerous shows and anniversaries taking place in British Wrestling. Here is just a selection of what is scheduled to take place. Let's get Ready For The Weekend. On Friday night, Preston City Wrestling will celebrate their 4th anniversary in style at their home of Evoque in Preston with The Fourth Awakens. The one match that everyone is talking about is the in-ring return of Kris Travis who shall face 'The East End Butcher' Sha Samuels. This match came about during a previous PCW show when Samuels interrupted Kris Travis and told the former PCW Heavyweight champion that he should go home and wait to die. Travis overcome a lot in the past year. On Friday, he's looking to show that he's back, he's very much alive and he's ready to kick Sha Samuels arse. Sitting right at the top of the championship tree, Dave Mastiff will make his first defence of the PCW Heavyweight Championship against the winner of the Road To Glory 2015 tournament, the current PCW Cruiserweight champion, Bubblegum. Dave Mastiff has fought for years to become the man in PCW, Bubblegum on the other hand has shown he'll go to any length to win, be it legally or not. Mastiff is a huge challenge for Bubblegum to overcome but he's overcome a lot in the past. Either man could be walking out with heavyweight gold. The Fourth Awakens will also see the return of the Team Single Open Challenge, this year won by Josh Bodom & Ryan Hendricks via public vote. Team Single are the longest reigning champions in PCW history but The Brolievers present an unknown to the champions as they never face each other before. Could The Brolievers upset the PCW Tag Team champions or will Team Single's dominance continue to reign? The show will also feature the débuts of Samoa Joe and Drew Galloway plus the return of reDRagon's Kyle O'Reilly & Bobby Fish who will join Noam Dar, Joey Hayes, Dave Rayne and many more in various matches. 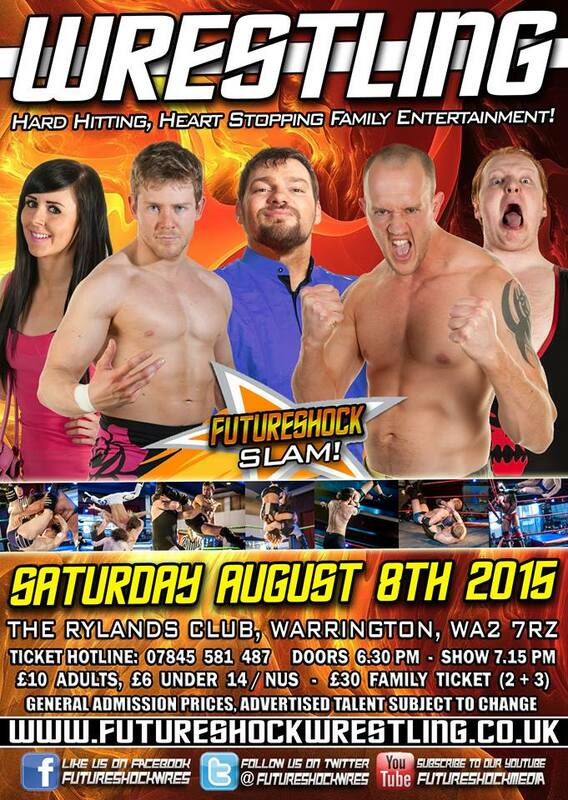 Saturday see's Futureshock Wrestling back in action, this time at The Rylands Recreation Club in Warrington. The main event will see Dave Rayne join forces with Jack Gallagher to face the man who he challenges for the Futureshock Championship at Underground 12 with his career on the line, Xander Cooper and his partner, Damon Leigh. Rayne will be looking to send a message to Cooper on August 8th and may well do so with Gallagher by his side. On the other hand, Xander Cooper will look to show why he's been so dominant as champion and why he'll end Dave Rayne's career. Talking of champions, Soner Dursun will once again put his Adrenaline Championship on the line, this time against the hard-hitting Mark Massa of The Uprising. Dursun has faced all challenges for the championship since winning it and Massa is one of the biggest challenges to date. From one championship to another as Danielle Hunter look to regain the Futureshock Women's Championship from the woman who won the title from her, Lana Austin. Austin has been on a huge winning run since capturing the championship. However, Danielle Hunter was a dangerous champion, she's an even more dangerous challenger. If Lana Austin want to walk out with her winning run and still champion, she'll need ever bit of heart and desire she has to do it. All this and a lot more including matches with Ashton Smith and Ryan Hendricks takes place this Saturday. Then moving on to Sunday, IPW:UK host their Summer Bonus 2015 in Tonbridge at The Angel Centre. The show will see the beginning of the UK Super 8 qualifying round with Jody Fleisch taking on Iestyn Rees and Scott Star facing a hand-picked opponent from the IPW:UK training academy. Those in attendance will also see Danny Duggan & Cieran Donnelly defend the IPW:UK Tag Team Championship against arguably the best tag team in the world, reDRagon's Kyle O'Reilly & Bobby Fish. This will be a big test for D&D and shall show what they are capable of against world-class talent and former world champions. The main event will see the unification of the IPW:UK World Championship and All-England Championship when Bad Bones meets Jimmy Havoc in a Tables, Ladders & Chairs match. The original match was supposed to take place at 'Title Showdown' but was postponed due to Jimmy Havoc suffering an injury. However nothing is stopping the match this time. Added in the stipulation that Jonny Storm & The London Riots are banned from ringside therefore aiding Jimmy Havoc, it really will come down to which man has the toughness, endurance and the desire to become a double champion on August 9th.